Why It’s a Bad Idea to Categorize English Idioms when Learning Them! English idioms are very useful for foreign English speakers like you or me because they allow expressing our thoughts and voice our opinion quickly and using the same phrase in dozens and hundreds of similar situations. Let’s take the following idiom – “Chip on your shoulder”. You can use it in pretty much every situation when someone feels they’re treated unfairly and they’re acting defensively but it’s obvious that there’s no good reason for them to behave that way and they’re acting so because of their own insecurities. So instead of describing the whole situation you can just use this short phrase instead – “He’s always had a chip on his shoulder, that’s why he’s acting that way!” It saves you time and effort, and such and similar idioms are used worldwide – “chickens have come home to roost”, “on the ball” or “elephant in the room”. But here’s what I’ve noticed – many idiom directories like grouping idioms by the actual words contained in those idioms. For example, the two idioms about chickens and the elephant would fall under the same category – animal related idioms. It might sound like a good idea to give all those hundreds and thousands of idioms some structure and make them easy to find. You’ll Find It Difficult to Use Those Idioms in Real Life! You’ll have little difficulties recalling them if you were asked to list sports related English idioms; but when it comes to using them in real life English conversations you just won’t have the necessary associations in your mind to relate this or that particular situation to a particular English idiom. You’ll Be Making Mistakes When Using Those Idioms! Everything is nice and well while learning idioms from your textbook or some website where they’re grouped in different categories. When you try actually using them, it’s a whole new ballgame and you’ll be making a lot of mistakes because of the way you learnt those idioms. 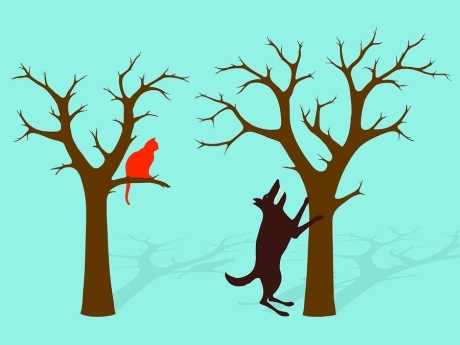 Let’s say, you learned the idiom ‘barking up the wrong tree’ as part of dog related English idiom list containing such idioms as ‘to put on the dog’, ‘can’t teach an old dog new tricks’ and so on. Now, the problem is that whenever you think of using one of those idioms during a conversation, you’ll be having flashbacks of other idioms in the same category. As a result, you might use the wrong idiom, words can get mixed up when you speak, or you may also find that your fluency is hampered because you have to make conscious effort to recall a particular idiom and you’re not capable of maintaining an easy-flowing conversation! This problem goes hand in hand with the ones I mentioned previously. To put it simply – if you have the wrong abstract associations created in your mind, you’ll also find it difficult to use the respective idioms and you’ll be also making mistakes when trying to use them! If you learn the idiom ‘to bark up the wrong tree’ having a picture of a dog barking at a tree in your mind, that’s what the idiom is largely associated with for you. When native English speakers speak, they don’t have these kinds of associations going on. They use that idiom whenever someone has misunderstood a situation and 99% of people would never have a barking dog’s image in front of their eyes when using that phrase. If you learn whole categories of idioms, you imprint the related images in your mind and that association will stay there for a long time. Do you want to find out how to learn English idioms effectively so that you can use them automatically and without much thinking? Well, here comes the most invaluable piece of advice that will take your spoken English improvement to the next level! English words hook up with each other forming collocations and idioms. Idioms in turn can be associated with different situations and events, and that’s the best way to learn them. Let’s say you read a new idiom “to shoot oneself in the foot”. Now, let’s forget any possible associations with shotguns, body parts, whatever. What you need to do in order to create proper contextual links in your mind is too look up examples of that idiom in use. Use the Internet, there are loads of great websites such as TheFreeDictionary.com where you can read sample sentences containing idioms. Do a Google search on that idiom, click on the search results and see how that idiom is used. For best results make sure to put your idiom in quotation marks so that only exact matches are displayed. Read those sentences many times over till you have a 100% understanding how that idiom is used. In the very end, you should most definitely come up with a few sample sentences yourself, and repeat them a good few times while at the same time imagining yourself in a real life situation. That way you’ll create associations between idioms and situations instead of idioms and abstract images that have nothing to do with the way they’re actually used! I believe that most problems related to idiom use arise from associating them with the respective pictures! 2. When such a situation arises, you can’t use the idiom because there’s no association in place! Therefore I suggest learning such and similar idioms within context AND imagining yourself in the respective situation instead of focusing what that idiom actually means if taken literally. It’s actually possible to use an idiom spot-on whose direct meaning you don’t know; for example, you don’t need to know that “right off the bat” is actually a sports related idiom and comes from baseball. If you create the baseball association first, it might make it more difficult to use that idiom in real life. If we learn that it simply means ‘immediately’ – we’ll find it much easier to use it because there’d be no associations with baseball bats etc. Native speakers usually know that the idiom has a literal and a figurative meaning. Sometimes, it helps to know both meanings so that you can use the idiom more appropriately in a certain context. Otherwise, you might be using the wrong idiom because you think it means more or less the same. So pictures do help you choose the better expression.